Of course, always happy to help! But before I launch into my suggestions, I want to first mention a few of my guiding principles/basic assumptions. First, I like my luggage like I like my men — handsome, sturdy and dependable; rugged, yet gentlemanly. In my picks you’ll see a predominance of canvas and leather and not a lot of fussy patterns and shiny thingamajigs — but I’m guessing that’s why you asked me. Second, you won’t find any backpacks here* — I haven’t been able to bring myself to wear one since the seventh grade, so I’m definitely not traveling with one — but I guessed with all of this stuff you’re going to be carrying, you’d want to keep your hands free sometimes, so I looked for bags you could carry on your shoulder. Third, I assumed that your camera is a DSLR and requires more space than a small point and shoot. Fourth, I assumed you wanted something in a carry-on size, so most of these will have a little space for extra items, like a change of clothes or a pair of shoes. Lastly, since you didn’t give me a price guideline I had a little fun and tried to give you options in a few different price ranges. Hope this helps! And let me know where you end up taking your new bag! 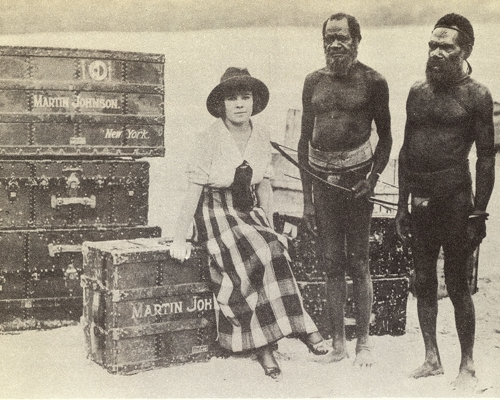 Osa Johnson and luggage, in Vanuatu. Perfect if you’re just starting your own travel kit, or were looking for something that won’t break the bank. While these options are lower in price, I sought out brands that have proven their durability. 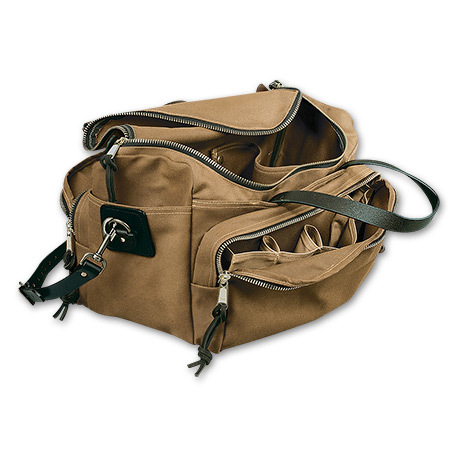 With lots of pockets and two snap-out dividers in the main compartment, the Filson Sportsman’s Bag has room to spare and lots of little nooks and crannies to exploit. As it was originally designed for huntsmen in the field, I’m sure this durable bag would be able to handle whatever you threw at it. Also check it out in otter green. 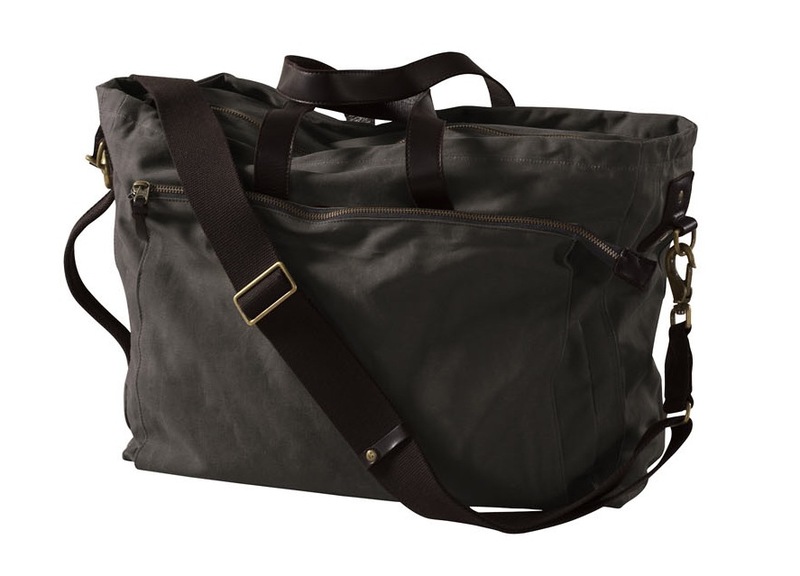 The Filson Sportsman’s Bag is made in the USA. An L.L. Bean Signature reissue of a bag that originally appeared in their 1933 catalog, this handsome leather bag is guaranteed to age beautifully. With the unconstructed interior, you really have the freedom to pack whatever might fit. While I was in Argentina, I posted about how much I loved my new 16″ tool bag from the San Fernando Valley Mercantile Co. and Warren has since informed me that it is completely sold out. If you had your heart set on it, fear not, you can pick up this slightly larger version. The San Fernando Valley Mercantile Co. tool bag is made in the USA. I first heard about this great bag from my good friend Jen, who also writes the great mommy travel site Parenture. When she touted the 1963 Trip Bag as a great to a alternative diaper bag for dudes, but I couldn’t help but think it would also be a perfect carry-on for me. The pricetag is definitely easy on the wallet as well. 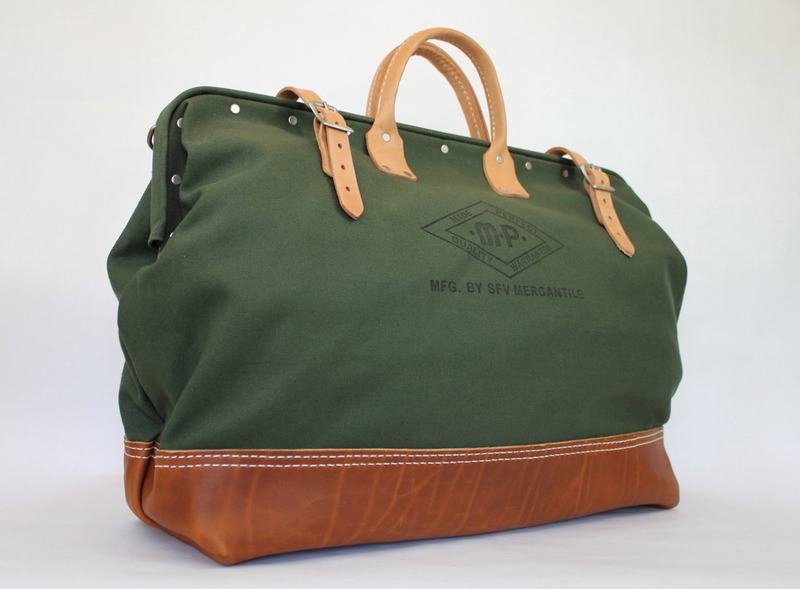 This clean and simple duffel by Archival Clothing really appeals to me. The two pockets on either end are perfect for your boarding pass and passport or perhaps a slim novella, a map or two and your phone. 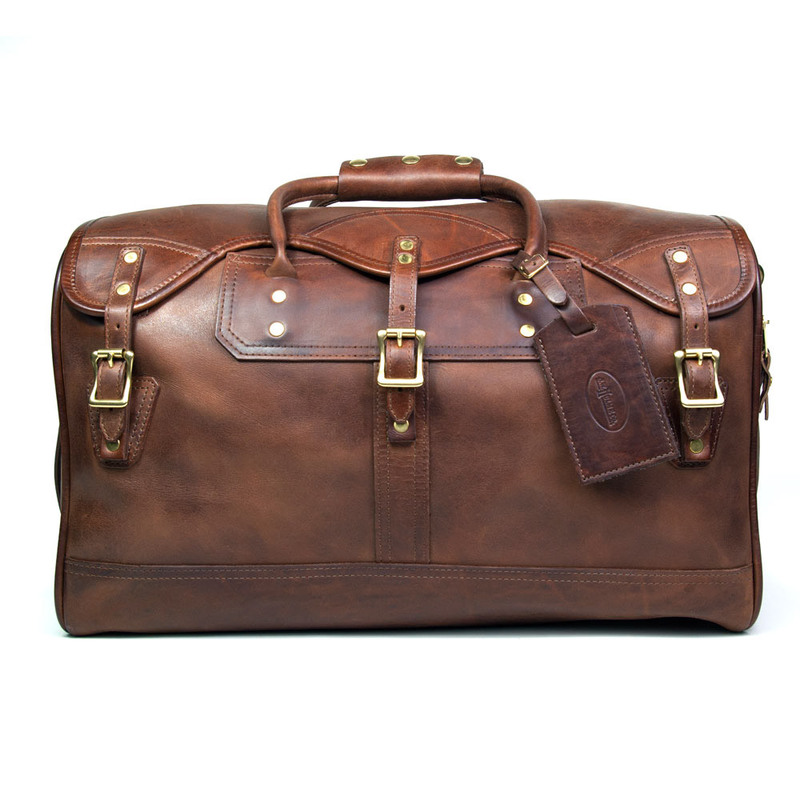 The Archival duffel is made in the USA. Were you are ready to make a more substantial investment, these would be my first look. I’ve long been a fan of Jack Spade, and actually carried one of their flap messenger bags around when I went to Egypt a few years ago. What struck me at the time were the smartly placed compartments and how easy everything was to get to when on the go. While I was traveling much lighter at that time than you will be, this petite duffle looks like a great alternative. Saddleback founder and world traveler Dave Munson prides himself on making some of the most — if not the most — durable leather bags available, backing them with a 100 year warranty, bragging that “they’ll fight over them when you’re dead,” and posting photos of crocodiles trying to eat them. Made of luxuriously large pieces of high-quality leather, what I love best about them is they don’t sacrifice style for function. (See Dave Munson talk about the construction of the bag here.) With all the straps and D-rings, I can perfectly see Dr. Henry “…we named the dog Indiana!” Jones strapping on one for an adventuresome archeological dig. I can see one on safari with Osa Johnson in the 1920s, and yet it also looks right toting around your Macbook and iPad. Get the large size, and you’ll be good to go. The folks at Col. Littleton, Tennessean purveyors of fine leather goods, clothing, knives and other such good stuff have a knack for designing the kind of bags I want before I even know it. 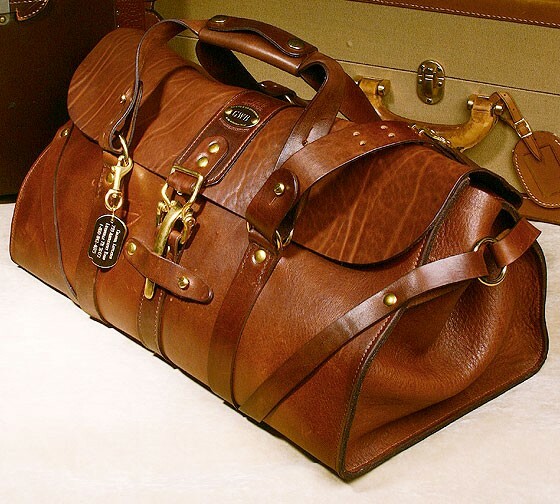 Perfectly achieving the kind of genteel adventurer aesthetic I love, I can see Col. Littleton’s bags in the hands of Teddy Roosevelt or Amelia Earhart, packed with the warmest cashmere, a flask of the finest whiskey, a book of short stories by Rudyard Kipling and an ivory-handled knife. 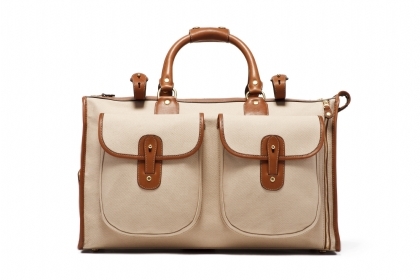 This gorgeous bag, the No. 1 Grip, takes its name from what used to be the common term for a carry-on from 1870 to 1940. “Grips” were not checked bags, were not given to porters, and were only to be handled by the owners. This bag opens wide to accommodate all of your treasured items and tightens securely with several lovely straps and clasp — and please do note the plate above the clasp, just waiting for your monogram. With handles for carrying it either on your shoulder or in your hand, this bag will see you around the world and back. Both the No. 1 and the No. 3 Col. Littleton Grips are made in the USA. Are you noticing a trend? Can you not tell that I am a girl with a special place in her heart for rich, burnished leather that will only get better with age, especially when it is paired with hardy straps and buckles and maybe a place for my initials? This duffle from JW Hulme hits that sweet spot and offers a bit more space than the previous two options, owing to its slightly more boxy shape. If you are a traveller like me, you’re always apt to return home with a few new small treasures and this bag would definitely have room to stow them away — perhaps even in the secret interior pocket, perhaps? I see myself grabbing this bag and heading out on hardy, rugged adventures in the American west. Possibly by stagecoach, but more likely on horseback or in a classic pickup or 4×4 — but this bag isn’t merely rough and tumble, it’s much too luxurious to be considered such. I especially love how the closure flap is a bit reminiscent of a saddle and that JW Hulme will emboss your initials into this gorgeous leather for free. Quite classy indeed. Throw this over your shoulder using the detachable strap and you’re ready for just about anything. 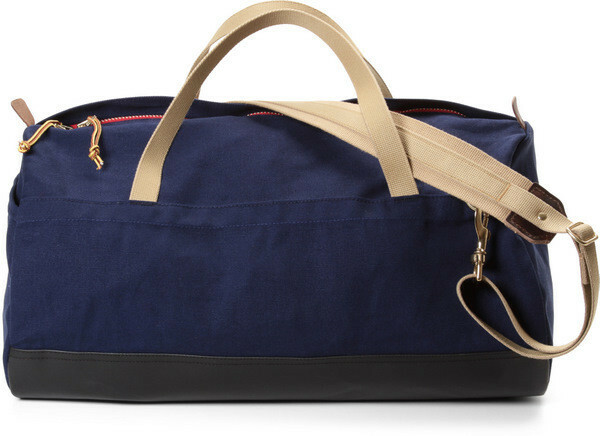 The JW Hulme Co. Classic Duffle is made in the USA. Time to dream of big budgets and the trips you could take. These pieces are the kinds of investments that conscientious travellers have been making for many years. If you are joining their ranks, I salute you. One day I shall see you there. The Ghurka Express bag makes me think of journeys in the style of Abercrombie and Kent or perhaps the Cunard Line or the Orient Express. A bit more refined than the previous options, I agree, but it is exactly the kind of luggage I would love to pass down to my own plucky, adventuresome daughter on the day she graduates from school and sets off to conquer the world. She’d do it too. This handmade khaki twill bag, edged in chestnut leather, has compartments galore and the clever, yet handsome, closures ensure all of your valuable items and whatnot will travel safe and sound. Also drawing my eye are the two external flap pockets, the umbrella straps, and the detachable shoulder strap. Outfitted with one of their classic luggage tags and stamped at one end with their lovely crest, detailed with banners, crossed tusks and the name of the bag, the reasons the Ghurka Express Bag has remained popular since its its introduction as one of the earliest Ghurka designs is readily evident. If you love this, but desire an all-leather bag, the Express is also available in a gorgeous chestnut leather. And yes, when I pass down my bag to my daughter, I will of course have to replace it with that. Quintessentially British and nothing but class, Swaine Adeney Brigg, Royal Warrant Holders to HM The Queen as whip and glove-makers and to HRH The Prince of Wales as umbrella-makers, manufactures the kind of bags my Anglophile dreams are made of. Makers of luxury travel goods, gentlemen’s accessories and equestrian goods of the highest quality for over 250 years, Swaine Adeney Brigg also happen to have designed the hat worn by Dr. Indiana Jones. So you can see we are definitely in the right place. This roomy bag zips completely open for easy access but cleverly placed side gussets hold its shape whilst you pack, offers a slightly boxy shape for extra room, and keeps everything safe and dry with a lovely flap — all in hand-finished traditional English bridle leather. 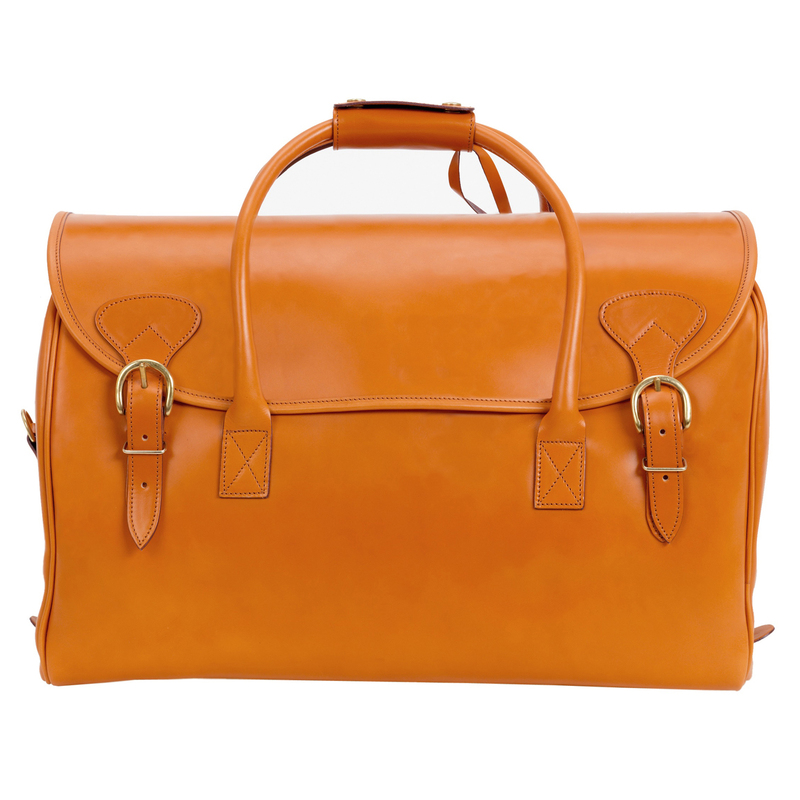 It is also worth mentioning that this gorgeous bag is made entirely by hand from start to finish by a single craftsman in their Cambridge workshop. It is the kind of handmade, traditional British luxury I’d love to call my own. While you’re at it, pick up their Whangee umbrella. What’s good enough for The Prince of Wales is definitely good enough for you. Backpacks should be a legitimate choice!. Putting weight on both shoulders evenly shifts the effort to the legs, and muscles don’t get dragged in strange new directions. I have moments when I think shoulder bags are sponsored by drug companies. I have faith in you: find a few backpacks! There must be elegant backpacks in the world. Oh my word, such beautiful bags! *swoon* Some of these are definitely going on my wish list, notably the Swaine Adeney Brigg Oxford, finances be darned. You are currently reading The Travel Kit: A Great Bag at Quite Continental.